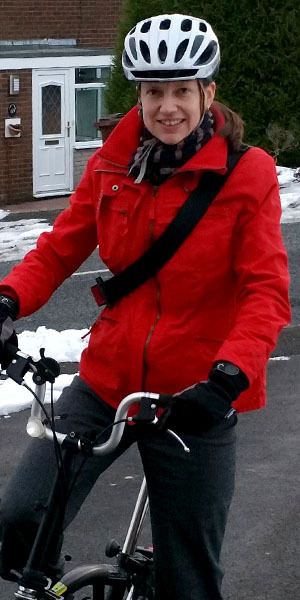 Emma Kane, Marie Curie Project Manager in the Faculty of Life Sciences, cycles from Simmondley to Glossop or Broadbottom Station, then takes the train to Manchester Piccadilly and cycles again to Oxford Road. What inspired you to give cycling a go? I decided the walk to the station was taking too long and my husband bought me a Brompton folding bike. What do you enjoy about cycling to work? I have done my little route so many times now it’s like my own personal bike circuit some mornings. I enjoy trying to make my journey more efficient each day, even down to where I put things in my bag like gloves, passes and keys! When the weather is nice or I’m feeling energetic I cycle further to Broadbottom station which is a really amazing route in the morning especially if the sun’s rising. What would you say to other people thinking of giving cycling a go? Try a route when you are not in a rush or arrange to meet one of the bike buddies that cover your area. I would also fully recommend a course with BikeRight if you don’t feel too happy about being on busy roads. Perhaps see if there are any flexible options for your route if you don’t want to cycle all the way to work e.g. travel via train part of the journey. Once you have done the route a few times I think it gets more enjoyable, so don’t give up too quickly!